For solitude and tranquility, the Isle of Kerrera takes some beating. Relaxation is the key, in company with goats, sheep and otters, and away from shops, cars and people. If you’re looking for a good day trip, just to get away from everything to relax and unwind, then you can do no better than go here. What the Island lacks in excitement, it more than makes up for with the feeling of peace you will experience here. It could be described as an awakening of the spirit, that almost feels like you have stepped back in time to an undiscovered land. This was how I felt on my visit here, and when I returned home I felt contented and refreshed, and I had this ‘feeling’ that the world was a really nice place. A pleasant five minute ferry trip across Oban Bay takes you to Kerrera. The island is just six miles long, it’s almost entirely free of cars, there are very few people, but it is an excellent location for wildlife, and wonderful views of Oban. There are no shops, although there is a tea garden near Gylen Castle, built by the Clan MacDougall in 1587. The castle is a ruin, but is open to the public following a ten year restoration. From the tower, you have great views across to Jura, Colonsay and Mull. Gylen castle was attacked in 1647 by General Leslie’s army during the Covenanting of Wars. Everyone resident in the castle was killed, even the ones who surrendered, and the castle was burned. 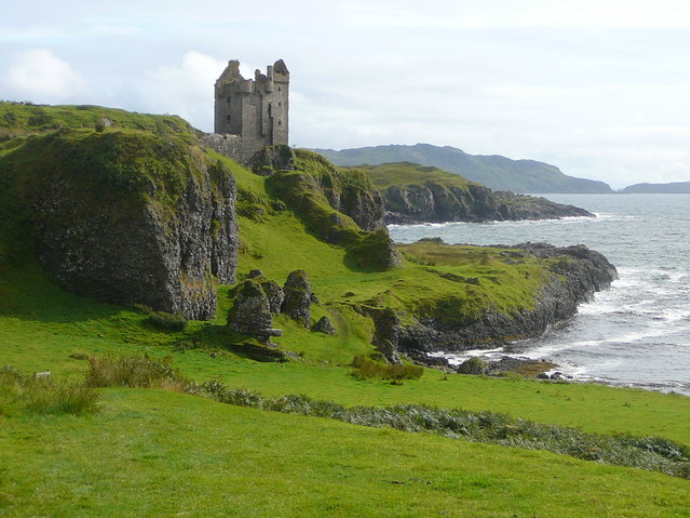 In 1660, Gylen Castle was returned to the MacDougall Clan Chief. The castle is open to the public all year round and there is no entrance fee. The Isle is also home to the monument in memory of David Hutcheson, the man who founded steamer services to the isles, including the one known as MacBrayne‘s. Only around 50 people live here, making the island an ideal unspoilt location for day trippers to enjoy walking, cycling or total relaxation. There isn’t much more I can say about Kerrera, other than rambling on about the peace and quiet, but if you find yourself in the Oban area, you should make a trip to see the peaceful Isle of Kerrera. If solitude is your thing, you’re guaranteed to get it here. Find A Hotel In Oban. Different providers, different prices, and user reviews. Save time and money, search them all here for the best deal.